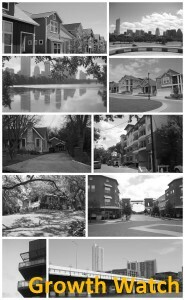 The City of Austin has 16 residential zoning districts and 13 commercial zoning districts, 4 industrial, and 5 special purpose base districts. In addition, up to 13 combining districts may also relate to a particular zoning case; these combining districts act as overlays to provide site or use specific conditions for an identified area or project. The zoning section also reviews demolition/relocation permits for historic buildings and districts for consideration by the Historic Landmark Commission, sign permits and alcoholic and beverage permits. Cases involving historic structures or National Register Districts have specific requirements in addition to the zoning process. A listing of Austin's base zoning districts can be found in Chapter 25-2 of the City's Land Development Code. To see the descriptions of each of each zoning district, please view the definitions of the below acronyms at this link. To find out what uses are allowed in a given base zoning district, please see the Permitted Use Chart. The following are special districts that, when combined with a base zoning district, may alter permitted site development characteristics and uses permitted on a site. Combining and overlay districts are designed to achieve special goals such as downtown design, economic redevelopment and parkland protection. Conditional Overlay (CO) - Modifies and restricts the use and site development regulations authorized in the base districts. All requirements are in addition to and supplement land development code requirements. Examples include prohibiting permitted uses authorized in a base district, increasing minimum lot sizes, decreasing FAR etc. Neighborhood Conservation Combining District (NCCD) - Preserves and protects older neighborhoods by allowing modifications to applicable development regulations in accordance with a neighborhood plan, which for NCCDs is intended to protect neighborhoods that were substantially built out over 30 years ago. Capitol View Corridor Combining District (CVC) - Are applied in combination with the various base districts to limit the height of structures within selected corridors which represent the remaining significant, publicly accessible views of the State Capitol Building of Texas, so that those views may be preserved and protected. Planned Development Area Combining District (PDA) - Is intended for combination with selected commercial and industrial base districts, in order to modify base district provisions as necessary to allow for appropriate industrial and commercial uses or to reflect the terms of the PDA agreement following annexation of properties subject to the agreement. 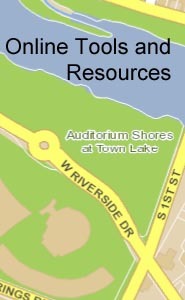 Waterfront Overlay Combining District (WO) - Reflects the goals and policies set forth in the Town Lake Corridor Study adopted by the City Council on October 24, 1985. The District is designed and intended to provide a more harmonious interaction and transition between urban development and the park land and shoreline of Town Lake and the Colorado River. There are 15 different subdistricts within the Waterfront. Mixed Use Combining District (MU) - Is intended to combine with selected base districts, to permit any combination of office, retail, commercial, and residential uses within a single development. The MU combining district is intended for use in combination with the NO base district only when its use will further the purposes and intent of the NO base district. Other acceptable districts are Limited Office (LO), General Office (GO), Limited Retail (LR), Community Commercial (GR), General Commercial Services (CS), Commercial Liquor Sales (CS-1). Central Urban Redevelopment (CURE) - Is a zoning district for the downtown area and several commercial corridors east of IH 35. The purpose of this recently added zoning district is to provide flexibility and incentives for development within the designated boundaries, including changes to site development standards and waivers from development fees with one application. Downtown Overlay Combining District - Is intended for combination with the CBD and DMU base districts in order to protect and enhance identified unique features of downtown Austin and peripheral areas. Capitol Dominance Combining District (CDZ) - Is intended for combination with selected base districts in order to protect the visual and symbolic significance of the State Capitol by keeping buildings in close proximity of the Capitol from dominating the structure. This district includes all land within a one-fourth mile radius of the State Capitol dome. Congress Avenue Combining District (CAZ) - Is intended for combination with the CBD and DMU base districts in order to protect the historic character and symbolic significance of Congress Avenue and to enhance the pedestrian environment along this unique downtown corridor. Sixth/Pecan Street Combining District (PSZ) - Is intended for combination with the CBD and DMU base districts in order to protect the historic character of East Sixth/Pecan Street and to enhance the pedestrian orientation of this unique urban area. Downtown Parks Combining District (DPZ) - Is intended for combination with the CBD and DMU base districts, in order to enhance the pedestrian use and vitality of downtown parks and to establish a unique urban design identity associated with these public open spaces. The DP combining district includes all land within 60 feet of the public right-of-way surrounding Brush Square. Downtown Creeks Combining District (DCZ) - Is intended for combination with the CBD and DMU base districts in order to promote public accessibility and pedestrian use along downtown creeks, and to protect and enhance the scenic character of these creek corridors. Convention Center Combining District - Is intended to protect and enhance the health, safety, and welfare of the public, to promote pedestrian activity and vitality in the Convention Center area, and to protect the existing character of the area.